For the second year in a row, lawmakers in the Maryland House of Delegates voted to approve a bill that would outlaw an insecticide called chlorpyrifos. Farmers spray the chemical on apples, peaches and other fruits, but scientists have linked the pesticide to brain damage in children. Delegate Dana Stein of Baltimore County, vice chairman of the House Environment and Transportation Committee, sponsored the legislation that would ban chlorpyrifos. The ban on the insecticide passed the House by a vote of 90 to 44 on March 15 – before it ran into trouble in the Senate. The measure had been supported by many public health physicians and environmental organizations, which have compared the toxicity of chlorpyrifos to that of lead. Scientists at the U.S. Environmental Protection Agency itself – which regulates pesticides – recommended a ban on the insecticide in 2015. But that proposal was overridden by a Trump Administration’s political appointee, Scott Pruitt, in 2017. Fighting fiercely against the proposed ban at the Maryland level has been the farm lobby, which opposes almost all regulations on pesticides with the argument that restrictions can hurt farmers financially. 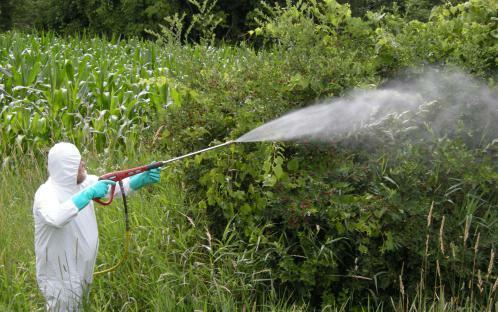 The manufacturer of the pesticide, Dow DuPont Chemical, also testified against the ban during a hearing in the Maryland House last month. Last year, Maryland fruit growers opposing the ban argued that they needed the insecticide to fight an invasive species, the spotted lanternfly, which had infested apple orchards in Pennsylvania. But this argument was undermined this year when Penn State University scientists in January said that chlorpyrifos is not among their recommended insecticides for controlling the lanternfly because there are less toxic alternatives. Regardless, the Maryland Farm Bureau fought hard against the ban on chlorpyrifos, claiming that outlawing one pesticide could lead to a slippery slope of banning more. In other words, she was saying that modern farming is so addicted to chemicals, we shouldn’t even look into the medicine cabinet. In the end, the farm lobby won. Its opposition to the chlorpyrifos ban convinced Democratic leaders of the state Senate to kill the legislation on Monday night. Democratic leaders said they feared that – with less than a week left in the legislative session – a protracted battle with both Republican and Democratic allies of the farm lobby would consume all the time available for what some Democrats regarded as a higher priority: trying to win approval of more school funding. Of course, the chlorpyrifos ban bill would have also helped school children, by preventing them from suffering brain damage from the fruit they eat. But unfortunately, the political influence of industry is a powerful toxin in our body politic.